Smart lock maker August has this week announced the availability of a new Apple Watch application that allows users to easily unlock any doors that are fitted with the August smart lock. Once the application has been installed on your wrist worn Apple Watch users are able to open and lock doors with a simple swipe or tap of their wearable screen. Controlling your August Smart Lock is now more convenient than ever. We’re excited to release a new version of the August iOS app that makes it possible to control your August Smart Lock with your Apple Watch. – Lock and Unlock Your August Smart Lock – initiate a lock or unlock from your Apple Watch with just a swipe and a tap. 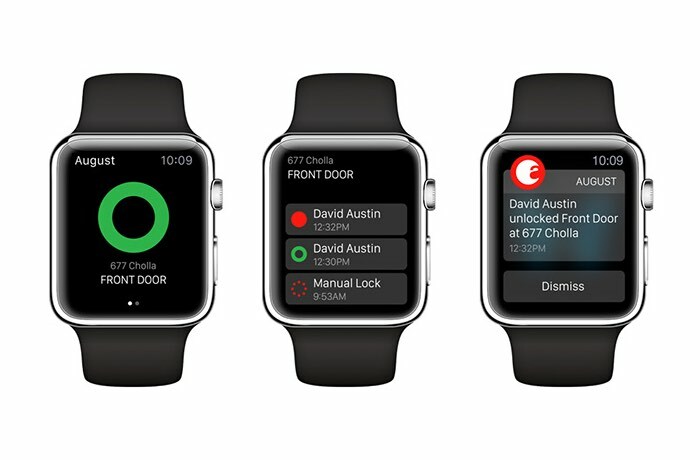 – View Your Lock’s Most Recent Activity – view a log of who has entered or exited your home and when, right on your wrist. – Receive Instant Notifications – get real time notifications when your door is unlocked so you have peace of mind. For more information on the new August smart lock Apple Watch app jump over to the official August blog website for details.